I had no idea that something could taste SO much better! No wonder I was never really a fan of the instant stuff in a packet. This is so easy and inexpensive! I bought all the ingredients for apx $12 and made a HUGE batch. apx 20 ~1/2 c servings. I looked at lots of recipes and kinda blended them all together and came up with this. Feel free to change it up to your taste. This filled 2 quart storage bags. Mix 3 Tb with 1 cup of hot milk. Freaking Delish!! 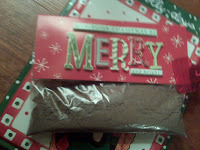 This entry was posted in Uncategorized and tagged CHRISTMAS, Christmas gift ideas, Hickory Mom Blogger, homemade hot chocolate, Mama Bird's Nest. WOW! I have made homemade hot chocolate before. But, this recipe ROCKS!!! Love our additions of the special dark and french vanilla. YUM!! Thanks for linking up and sharing such a great recipe for the season. I want to make this! Lisa~ It really is delish! I never really cared for Hot Choc before- NOW, I see why people love it so! I like that you add cayenne pepper, I bet that adds a lot. I like to add a little grated chocolate to mine as well. I love the special dark in hot chocolate!! yum. I love to make hot chocolate on a cold evening. THANKS!!! for the YUMMY!!! recipe.